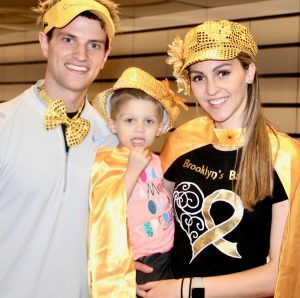 Around the world, families, caregivers, charities and research groups use the color gold to drive much-needed awareness for pediatric cancer. As an Upper East Side foundation, we would love for you to join us and GO GOLD this month! For the past 11 years, Candlelighters NYC has helped kids fighting cancer and their families. Kids from all over the world come to New York City to receive the best pediatric cancer treatment available. Candlelighters NYC assists through all stages: discovery, diagnosis, education, treatment and remission. We provide an emotional support system full of love and comfort while they are so far away from home. We add quality of life to children with cancer by providing them with a fun, positive atmosphere to help them feel normal in a situation that is so far from that. Candlelighters NYC becomes their New York City family so that they can just be kids. You can help! Your donations are critical to supporting these families. Donor funds cover every expense at Candlelighters NYC (food/toys/transport/strollers/etc). When you make a gift, you directly impact families facing pediatric cancer right here in NYC. They need your help and greatly appreciate the support. If you want your business (or building!) to go gold this month, Candlelighters NYC would love to help decorate. Email us at info@candlelightersnyc.org for more information. To see firsthand what we do, please click here and watch CNN’s recent spotlight about our organization!